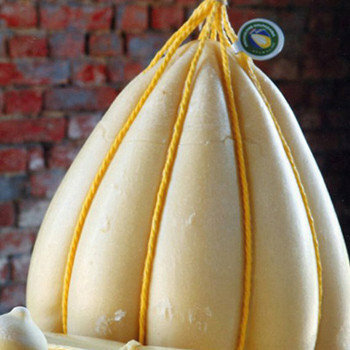 The Provolone Valpadana PDO is a traditional cheese, the fruit of generations of interaction between the important factors that connect it to its territory: the geographical characteristics, agricultural production and history of the men who have lived and worked here. It’s thanks to the Cistercian monks who carried out the vast operation of reclamation and channeling of spring water and surface water in the area between the Lambro and Adda Rivers. This laid the foundation for the development of a cereal-livestock production concentrated on the breeding of dairy and cheese making cattle, which spread from its original core in the lower Milanese through the entire Po Valley, establishing itself as the farming valley’s main economic resource. In the second half of the 19th century, the happy marriage between the “paste filate” (spun paste) cheese culture stemming from the south of Italy and the local dairy vocation was born in the Po Valley. In 1861, the unification of Italy made it possible to overcome barriers between the different peninsula areas and, therefore, the arrival of entrepreneurs from the south, who had moved their production activities to Piacenza, Cremona and Brescia. This lead to the spread of the culture and consumption of “paste filate” (spun paste) cheeses through the whole country. The Po Valley offered a great availability of suitable milk for cheese making and also the infrastructure needed to achieve quality products, which paved the way for the evolution of a Provolone produced in different formats (from a few hundred grams and more than a ton). The designation “Provolone” appears in literature for the first time in 1871 in “Vocabolario di agricoltura di Canevazzi-Mancini” (Cappelli, 1871). “Provolone” literally means a large provola. A completely original cheese, it is distinguishable from the other “paste filate” (spun paste) cheese widespread in Southern Italy for its large size and ability to ripen for long periods without drying out excessively and without therefore becoming a cheese for grating. The “Valpadana” designation of origin was first accompanied by the title “Provolone” in 1993 (DPCM 04/09/1993), a culmination of a centuries-old tradition that has determined the characteristics for which the cheese is known and appreciated. the municipalities of San Rocco al Porto, Caselle Landi, Castelnuovo Bocca d’Adda, Guardamiglio, Santo Stefano Lodigiano, Corno Giovane, Corno Vecchio, Meleti, Maccastorna, Senna Lodigiana, Somaglia, Fombio, San Fiorano, Maleo, Codogno, Cavacurta, Camairago, Castiglione d’Adda, Bertonico, Terranova dei Passerini, Casalpusterlengo, Ospedaletto, Lodigiano, Orio Litta, Livraga, Brembio, Turano Lodigiano, Segugnago, Borghetto Lodigiano, Ossago Lodigiano, Villanova del Sillaro, Mairago, Cavenago d’Adda, San Martino in Strada, Massalengo, Pieve Fissiraga, Conegliano Laudense, Lodi, Corte Palasio, Crespiatica, Abbadia Cerreto, Boffalora d’Adda belonging to Lodi Province. the entire administrative territory of the provinces of Verona, Vicenza, Padova and Rovigo. the entire administrative territory of the province of Piacenza. the municipalities of Ala, Avio, Besenello, Brentonico, Bleggio Superiore, Bleggio Inferiore, Calliano, Folgaria, Isera, Lomaso, Nomi, Nogaredo, Mori, Ronzo Chienis, Rovereto, Trambileno, Vallarsa, Volano, Arco, Dro, Molina di Ledro, Nago-Torbole, Riva del Garda, Terragnolo, Pomarolo, Villa Lagarina, Aldeno, Trento, Cimone, Garnica Terme, Terlago, Vezzano, Padergnone, Calavino, Lasino, Cavedine, Drena, Tenno, Fiave’, Grigno, Cinte Tesino, Castello Tesino, Pieve Tesino, Ospedaletto, Ivano Fracena, Strigno, Samone, Bieno, Spera, Scurelle, Carzano, Villa Agnedo, Castelnuovo, Telve, Telve di Sopra, Torcegno, Ronchi Valsugana, Borgo Valsugana, Roncegno Terme, Novaledo, Levico Terme, Vignola, Falesina, Frassilongo, Fierozzo, Palù del Farsina, Sant’Orsola Terme, Bedollo, Baselga di Pinè, Fornace, Civezzano, Pergine Valsugana, Tenna, Bosentino, Vigolo Vattaro, Vattaro, Calceranica al Lago, Caldonazzo, Centa San Nicolò, Lavarone, Luserna. Grana padano against UN: it doesn’t hurt. We are ready to defend our cheese. Parmigiano Reggiano: is the first DOP in the world.